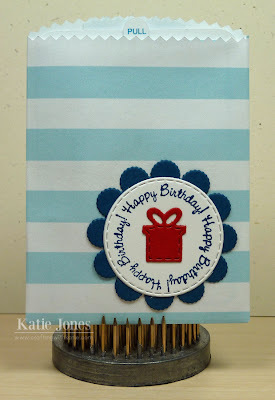 I learned how to make this fun interactive birthday card in Silhouette Studio as part of Kerri Bradford's Hello There class. We made the original card in more girly colors, but it was super easy to change things up so that I could give this to one of the little boys in my class this week. I think he will love tearing back the strip to see the message inside! I couldn't resist making another one of the bags that I learned in the class last week. It was easy to change the colors and adjust the size to fit this little card. I embellished it with a cute little sentiment made with My Creative Time's All Around Holidays and Scallop & Stitched Circle Dies. I think little Ben will be very excited to find this on his desk Thursday morning! Katie ~ Oh my WORD!!! Okay that interactive card I seriously ADORE!!! How fun is that for your student! Then the envie ~ your really killing me here with this class! 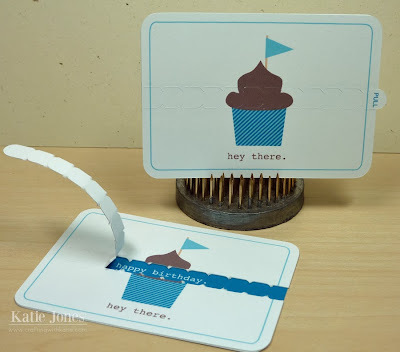 I made a couple of cutting files for the "Secret Message" interactive cards earlier this year. Everyone who has received one of the cards I made has loved it. I shared the cutting file over at my blog. They are fun to give. I love the envelopes you shared. I can hardly wait to try it.